Talked to Phil Joy on the phone this week. He has been doing alot of fishing at Great Barrier Island. He reports Medlands and Kaitoki Beaches generally produce small snapper during the day with better fish being taken at dawn or dusk and in stormy, overcast conditions. 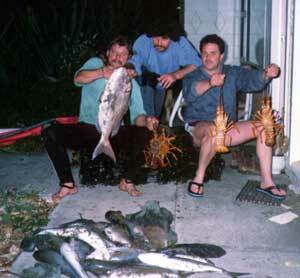 (File Photo 1989) Phil Joy is the only kitefisher we know of who has caught crayfish on his kite. Phil (holding the snapper) reported snagging up something well offshore and after a gruelling hour and a half of hauling and, with the line dangerously close to breaking, was thrilled with the catch of 4 snapper, 11 kahawai, 1 trevally and a mackerel. The biggest surprise however, arrived after the fish had been landed- a craypot, complete with 4 legal sized crays in it, tangled in his leader section. He was ecstatic. The snapper are still in close. I had a spare couple of hours last Wednesday afternoon so shot across to Browns Bay. I only had time for one quick set of a 25 hook Boat Longline. I nabbed these three outside and a bit to the south of the reef on 4/0 Target Hooks. Well the week has been very good for Beach fishing with light westerly winds and no swell to talk about, but the fishing has been patchy. A few reports of some good catches of gurnard by Kites and Longlines have come in and the catch of the week was a 12lb snapper taken off the beach by a surfcaster in front of the County Club. So, the snapper are still around close in, as well as in the Bay. 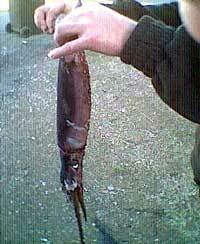 On the right is a photo of a squid which was washed up on the Beach on Tuesday morning still alive. It was found by Kyle Sciascia down at the Rocks at the Southern end of the Beach. The kahawai fishing contest is picking up, with school holidays a few of the locals boys with new Fishing Rods ex our Shop are often out trying to catch the big one. Don't forget to weigh in your catch, its free. No entry Fee! If you are in the area and want a chat about the fishing and a cup of coffee, or want to watch the Pauls kitefishing video, feel free to call in at the shop. Diane from Laurenson Marine in Kaitaia reports her father Bill has been making the most of the breaks in the weather recently to get out fishing. Bill regularly fishes the Awanui Harbour and specialises in catching big trevally. Fishing from a boat and using mullet for bait he recently hooked and landed a 6kg trevally. This is an excellent effort using only a handline. This fish was caught close to the beacon nearest the shore. Bill has caught some gigantic trevally over the past couple of years. His personal best is a 27lb trev caught two years ago. He also landed a 20 pounder at the beginning of November last year. The big fish are obviously in the harbour and this weekend looks like a good time to get out and target these fish. The prevailing northerlies have been good news for those fishing in the South Taranaki area. Hamish from Taranaki Hunting and Fishing has been out in a dinghy in the past week. 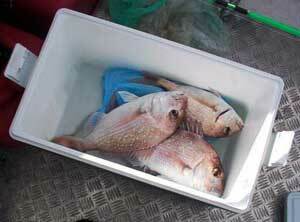 Leaving from Ohawe, north of Hawera, Hamish landed 18 snapper with four fish weighing over 10lb. The secret to his success was the pilchards he was using for bait and the fact that he was straylining the baits back into the current. Those in the Taranaki area should take the next opportunity to get out and hook into some of these snapper when the weather permits - these fish are in very close to the coast and well within range for those with kitefishing rigs. Whitianga is still the place to be if you want to be catching snapper, trevally and terakihi. Kathy from Bay Bait and Tackle reports a couple of locals coming into the shop with a good catch of fish after being out in a boat for the day. They had three 15lb snapper included in their mixed bag. Interesting to note the small snapper are also still being caught in the area along with the odd big one, so use Target Hooks if you want to give the small ones a chance of survival. The snapper are further off the coast this time of year as the contest last weekend at Kuatuna proved. It was a land-based contest and only one snapper was caught. Plenty of kahawai and a good sized kingfish were caught off the rocks. Sounds like the place to be this weekend with your kite gear. If you do go fishing this weekend, send us a report for next week's newsletter. 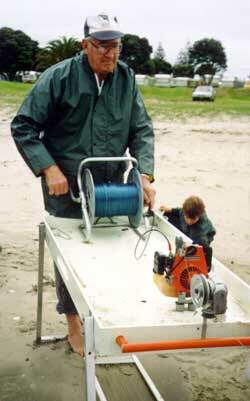 Well known kitefishing club member Peter Johnston passed away on Saturday 6th July. Peter was renown within the club for his engineering skills. He was one of those rare people who was always available to help members with winch building, submarine construction, rolling weights or any other kitefishing gadgets they wanted made. Peter also assisted Paul's Fishing Kites with kite development and construction methods. He also assisted with staff training and quality control. Peter was a great asset to the club and Paul's Fishing Kites and will be greatly missed by all who knew him. Photo - Peter at a club day out on Orewa Beach, demonstrating a capstan winch, one of his many kitefishing related inventions.